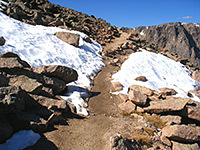 The trail to Longs Peak may be the most challenging in Rocky Mountain National Park but the paths starting at Bear Lake and Glacier Creek are the top choices for a day hike, as they access a particularly scenic region of the park, containing over a dozen lakes, three glaciers, peaks up to 13,150 feet, several deep ravines and a section of the continental divide - all in an area just 3 miles across. The official trails are one-way, leading along the valleys and to one summit, but a loop can be made by hiking off trail for 2.5 miles, to link two of the maintained paths. 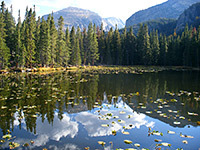 The complete journey is 13 miles long and involves 3,250 feet of elevation gain, visiting (in order) Bear Lake, Flattop Mountain, Tyndall Glacier, Hallett Peak, Andrews Glacier, Andrews Tarn, The Loch, Lake Haiyaha, Dream Lake and Nymph Lake. The hike is only suitable for mid to late summer, however, as too much snow is present at other times of the year. 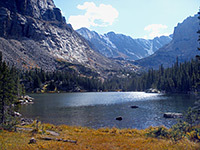 The start point for the hike is at the Bear Lake trailhead, the most popular in the park, with space for several hundred vehicles, yet even this is insufficient in summer when most hikers have to leave vehicles several miles back down the road and travel the remaining distance by shuttlebus. Summary map of the trail. 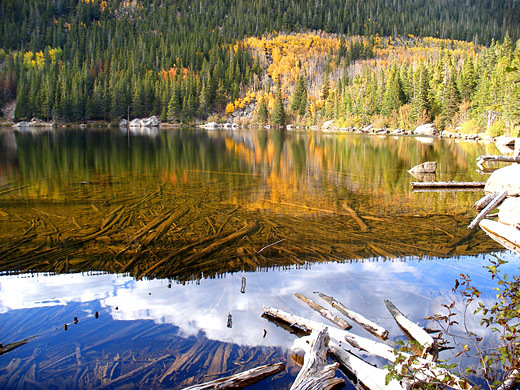 The loop hike begins along the paved path that encircles Bear Lake, providing many places to stop and appreciate its scenic setting, directly beneath rugged mountain slopes that rise up 3,000 feet a short distance west. Another path forks off near the northeast corner, climbing a steepish slope for half a mile to a junction with a route to Bierstadt Lake; turning left, the trail climbs a little more to a plateau right above Bear Lake, though trees obscure the view downwards. The land remains fairly flat until a second junction, this time with a longer, lesser used path to Two Rivers Lake and Odessa Lake. The main trail then begins a continuous, steady ascent of another 2,400 feet up the side of Flattop Mountain, through dense trees for the first third of the way (the steepest section, with several lengthy switchbacks), moving above the treeline for the last two thirds, which is slightly less steep and more straight. The initial stretch offers some views of the wider landscape including a named overlook of Emerald Lake, but tall pine and aspen trees enclose the route most of the way, so this part of the journey is quite shaded. The forest fades away quite suddenly - the pines change from full size to half size to stunted trees just a few feet tall - over just ten minutes walking, until all are gone, replaced by grass and a few straggly bushes. Only then is the true scale of the surroundings evident, as high peaks rise all around, some bearing permanent snowfields, while many deep, forested valleys stretch out below. The summit of Flattop Mountain is still 2 miles away, and because the land slopes quite gradually upwards, the peak is not in sight until near the end of the hike, instead most of the climb just reveals more of the curving hillside above. Shortly before the summit, the path nears the edge of a canyon to the north (Tyndall Gorge), allowing a good view of its glacier and the dark, jagged rocks at either side. The actual summit is rather indistinct since the top is nearly flat for half a mile or so, but the high spot (12,324 feet) is marked by a post, at the point where all the land to the west comes fully into view - the near ground is formed by a wide, grassy tundra plateau extending several miles north and south, beyond which are many other peaks, and Kawuneeche Valley/Shadow Mountain Lake are visible in the distance, ten miles southwest. From the summit of Flattop Mountain, the official path heads west for half a mile to a junction; both branches stay on the plateau for a while before starting the long descent to far-away trailheads in the west of the park, but a fainter trail turns south, running along the rim above Tyndall Glacier, past an NPS sign warning of its steepness and the dangers of trying to descend into the gorge. The next mountain is 12,713 foot Hallett Peak, whose summit is much better defined than Flattop, and is covered in large boulders for the final few hundred feet. An indistinct trail winds its way to the top, though any direct route is just as easy. The peak provides an alternative view of Tyndall Gorge, and of the next ravine south (Chaos Canyon, also containing a small glacier). Continuing south, now without any path, an easy descent of the bouldery south face of Hallett Peak reaches the head of Chaos Canyon, and another warning notice, then, after crossing the west side of another peak (Otis), the smooth white dome of Andrews Glacier comes into view. 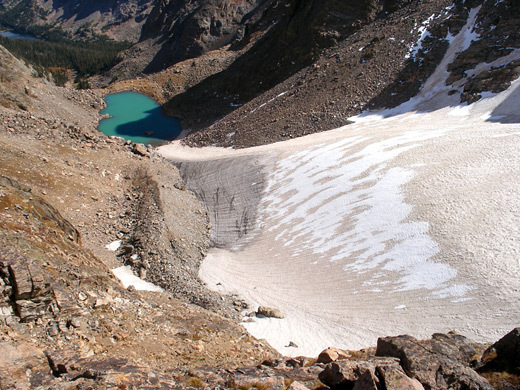 Andrews is the largest glacier hereabouts, the most scenic, and also the easiest to traverse. The snowface is not quite as steep as it appears from the top, but needs at least an ice axe and crampons to descend, and is large enough to contain dangerous hidden crevasses. 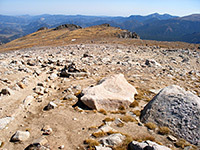 In mid summer, the simplest way to go down is via the steep scree/boulder slope on the north side, beginning about 1/3 mile along the rim, directly below Otis Peak; this is quite easy as such descents go, since there are plenty of firm rocks for hand and foot holds, generally with no need to walk on the loose scree. The slope leads right to the base of the glacier, giving a good chance to observe its structure, and after crossing the snow and embedded rocks along the lower edge, the off-trail portion of the hike is completed by a short scramble across some boulders, to the end of the maintained path to this point - 5.3 miles from the Glacier Gorge trailhead and 6 miles from Bear Lake. 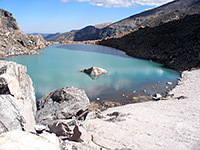 Directly below the glacier is Andrews Tarn, a small, pretty lake filled with the characteristic milky blue waters that result from glacial snowmelt. The path leads from the edge of the tarn down the steep, glacier-formed boulder field below, winding between some quite large rocks that make the way ahead not always obvious. This rocky slope ends at a pleasant, sheltered area where a small stream flows through a meadow, just as the trees start to return; after here the path re-enters thick forest and is soon descending steeply once more, alongside fast-moving Andrews Creek to a junction with a path to Glass Lake and Sky Pond. The next section is a little less steep, following a larger stream to The Loch, the biggest lake in the area. The reflective waters, rugged mountains to the east, and sheer cliffs bordering some parts of the shoreline make this one of the most scenic lakes around. The path runs all along the northwest side, staying close to the water, then starts another quite steep descent through thick, moist forest to a four-way junction. Straight on leads to the Glacier Gorge trailhead and right is to Mills Lake/Black Lake, while left, the least used path, is back to Bear Lake; this is fairly flat at first, later climbing gently as it traverses more open hillside where the tall trees are interspersed by grassy areas, crossed by small streams. At a junction, a spur path leads to the edge of Lake Haiyaha - another scenic location backed by rugged granite cliffs beneath Hallett Peak. The shore is ringed by huge boulders so to move very far around the edge needs some energetic scrambling. Haiyaha is the furthest of the lakes usually reached by day hikers from the Bear Lake trailhead so is rather busier than The Loch. After crossing the lake's outlet stream, the main path curves around the end of a ridge and zig-zags down a cool, shady hillside to the east side of Dream Lake; this is small and narrow, again with high rocky mountain slopes as a backdrop. 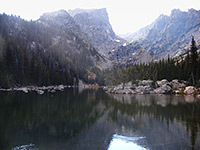 An optional side path reaches Emerald Lake, 0.4 miles further into the hills, beyond which the canyon becomes too steep to follow easily. Dream receives even more visitors than Haiyaha as it is only one mile from the trailhead. The final section of the path is down a fairly open slope, through pine trees and grassy clearings, round the edge of small Nymph Lake and half a mile more to the parking area by Bear Lake.